Fortech is proudly supporting the Startup Europe Summit, hosted for the first time by the Romanian Presidency of the Council of the European Union as it took over the rotating Presidency Programme and in partnership with the Romanian Ministry of Communications and Cluj-Napoca City Hall. The event is taking place during March 21-22 in Cluj-Napoca. 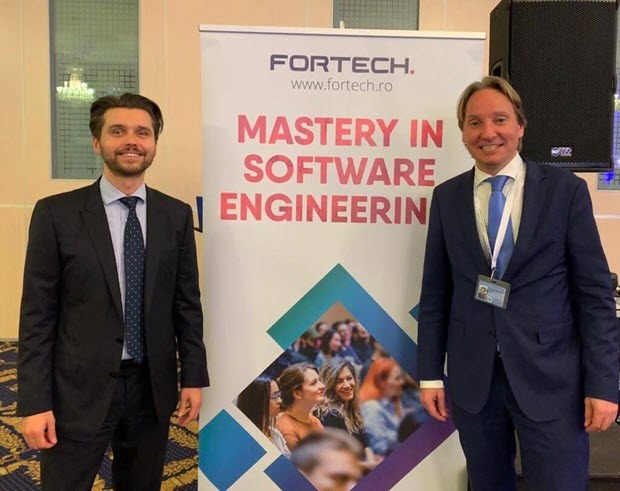 Fortech joins the powerful suite of technology entrepreneurs, the startup founders from Central Eastern Europe and West European players from the innovation ecosystem who gather under one roof to learn and talk about the founding and scaling a tech business. With continued interest in the subject, Fortech is here to connect and share perspectives on the tech business with the participating startup founders. Shaping the beginnings of a tech business and its evolution cycle to the first MVP, scale-up and distribution is a journey Fortech has always been energized about. Given its level of maturity and stability, the company has the capacity to nurture tech ideas and help them grow into products. Usually, the founder comes in with solid domain understanding and a business case and Fortech complements with a mix of resources that include funding, technical insight, development capacity and support in go-to-market strategy. This partnership structure allows the team to build the product fast, iterate the product and add new features on the fly. During the 2-days event, startups from 35 countries have the chance to get inspired by technology leaders, pitch their project or learn about funding opportunities, either private funding such as Fortech provides or dedicated programs run by the European Commission.